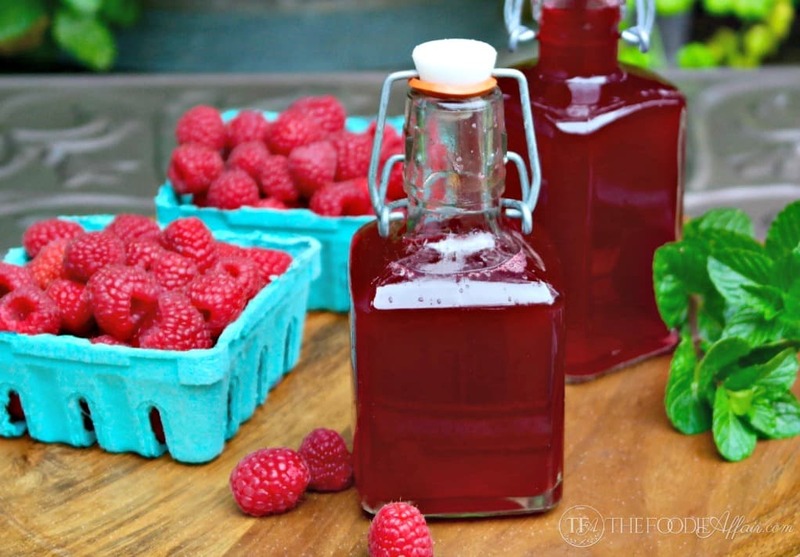 This homemade raspberry syrup is made with three ingredients: fruit, water and sweetener! 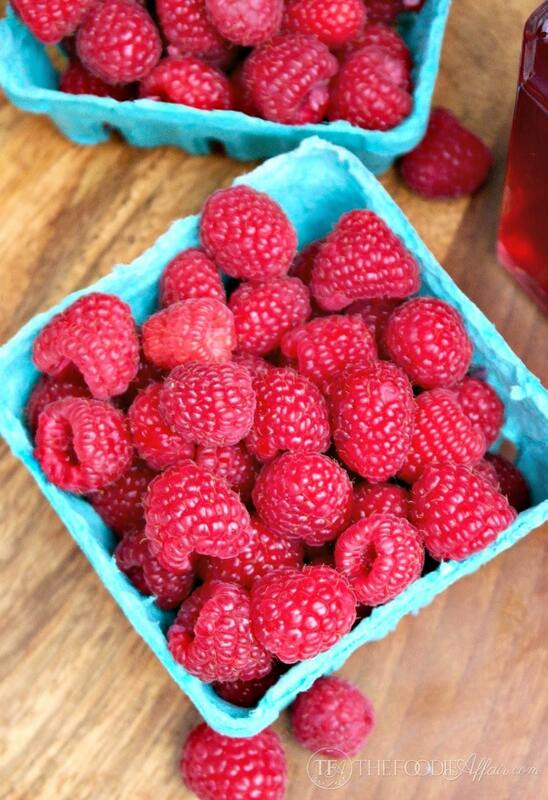 Doesn’t the red from the raspberries look so pretty? No food coloring or preservatives are in this syrup! What a delicious way to enhance the flavor of tea, sparkling water or use to make cocktails! I took soda off my shopping list several years ago. The drink used to be a staple in my diet and I would always have it in our refrigerator. I liked the convenience of popping open a flavored beverage, and I thought it was super cool to swap regular cola for diet saving 180 calories per drink! Then (3-4 years ago) a health conscious co-worker shared with me some research on the health implications that diet soda can cause to our well-being. Basically, the ingredients that are used in low/no sugar soda (saccharin and aspartame) can negatively impact our health (cancer). On the other hand, the FDA states that the cancers reported only affect rats (learn more from the National Cancer Institute). Regardless of which side of the fence you lean towards, I decided to limit my soda intake. Try a variety of flavored syrups! But I still enjoy a carbonated beverage and I found a healthier way to enjoy it by making a copy-cat Torino syrup. 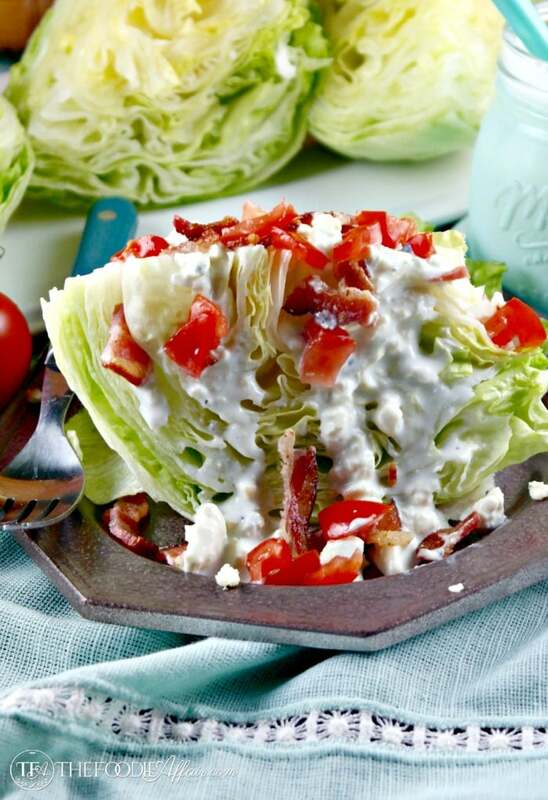 You can use this same recipe with different types of fruits like strawberries, blueberries or blackberries. Get creative a try a mixed berry syrup! Adding a splash of this syrup to sparkling water is so refreshing and I bet kids will prefer this to soda! Not only can this add a tasty layer of flavor to drinks (coming up – Italian soda & a cocktail), but it can also be thickened up (by cooking it longer) and poured over pancakes, waffles, French toast or even ice cream! I bet this would be tasty in brownies too! 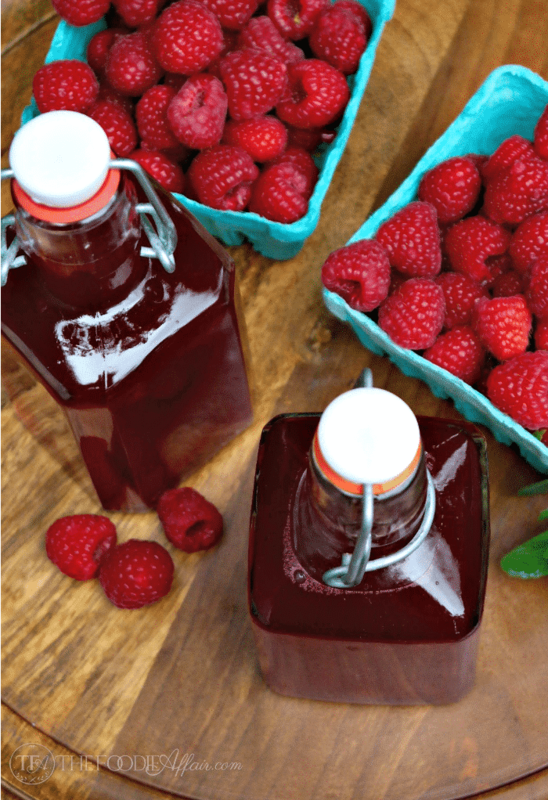 Easy homemade raspberry syrup made with fresh fruit. Enjoy in drinks like soda or cocktails. In a small saucepan add water and sugar and cook on medium-high heat until sugar dissolves. Add raspberries and bring to a boil. Lower heat to simmer and remove any foam that forms over the raspberries. Simmer for 25 minutes. Remove from heat and strain syrup over a clean bowl. Discard fruit (most of the bright red color will be transferred to the syrup). Clean the saucepan or use another and place the red syrup back in the pan. Simmer for an additional 15 minutes. Cool and strain into clean jars. Keep in refrigerator for up to 1 week. Use this syrup to make an Italian Soda. You also might want to try making your own sugar-free syrup! Try try this grenadine syrup! We can get real creative with the flavors when we make our own soda beverages! That raspberry syrup does look stunning! Thank you for stopping by my page. I hope to make this recipe when I’m back in the states this summer as raspberries are ridiculously expensive in Dubai ($10 for one of those small square boxes). Oh, I wish I could send you some raspberries! They’re 2 for $5 right now in California! And it’s so easy to make! Hope you try this soon! This looks so tasty! I gave up soda too and I bet this would be great in sparkling water or as an Italian soda! Yum! What a lovely sounding recipe, I can’t wait for soft fruit season to roll back around, will definitely make this when it does! I forget that I live in an area where fruits are abundant year round! I hope you do give this a try. Oh yum! This looks very good. I love making my own fruit syrup. This would make a great punch drink. Now that’s a GREAT idea for my next gathering! We’ve been eating raspberries like crazy around here lately! This syrup is such a great idea!! Looks fabulous. We don’t drink soda in our house either, usually water or iced tea. This syrup would be wonderful in iced tea I think! My husband drinks a lot of iced tea and he added some syrup and loved it! 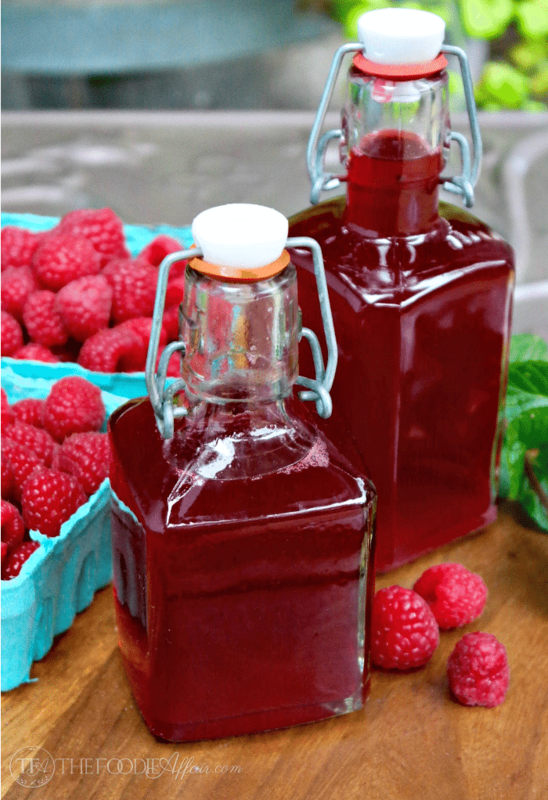 I can think of a million ways I would use this raspberry syrup. I think this would be lovely frozen in ice cube trays and added to your favorite beverages like lemonade or just soda water too. Wishing you a super week. I’ve been making a lot of flavored syrups for cocktails lately. I need to add this one to my list. I love that you did not make it quite as sweet. That is the way I prefer it. I see a new cocktail coming Friday night. Perfect for mixing with cocktails! I love it for that! This would be fun to add to cocktails! And very pretty too! I love this! I don’t drink very much soda, but my husband and son do. Though I try to limit how much they drink somewhat by “forgetting” to pick up some at the store, lol. 😉 Love the idea of using a homemade flavored syrup in club soda! LOL – that’s exactly what I did – forgot to buy it and then eventually told the fam I wasn’t buying it anymore! It took awhile, but they’re mostly on board now! This syrup looks amazing! I love raspberries! What a great syrup to have on hand! Im thinking up many uses for it! Thanks for sharing! Not a big soda drinker either, but with this syrup and some carbonated water, I could make a go for a homemade one! 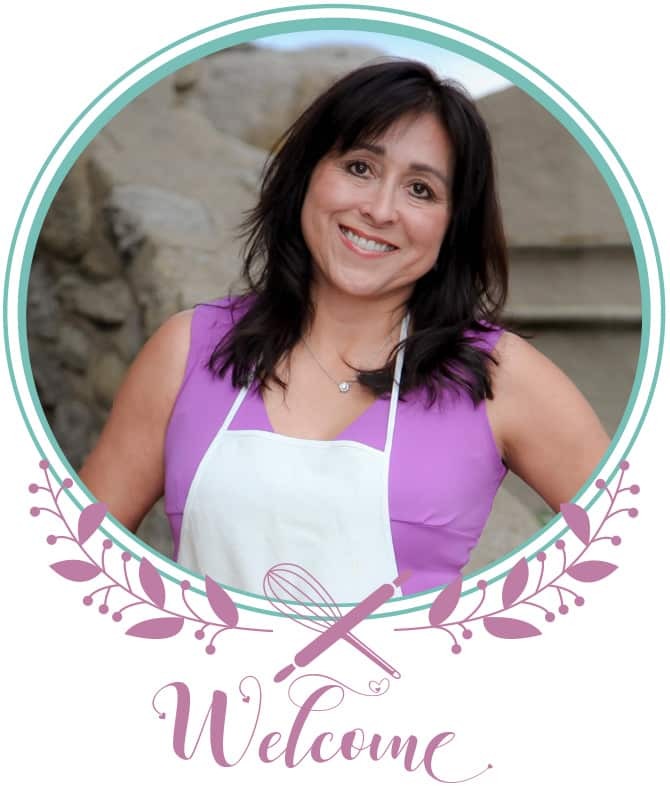 Gorgeous and simple—that’s my kind of recipe! Raspberries are my FAVORITE!! This sounds fantastic! Love this to mix with tonic. I took soda off my shopping list a few years ago too. I don’t miss soda, but I do miss having something besides water all the time! Can this syrup be frozen? Hi Sheila! I haven’t tried it, but I bet it will be fine if you do!